Lovers of Japanese cinema should find themselves in San Francisco during the weekends of April 14th/15th and 21st/22nd for the Cherry Blossom Film Festival. And if you especially love the work of director Iwai Shunji we have a giveaway for you. Screen Anarchy is pleased to offer you and a guest a double pass to one of Iwai's films playing during the opening night of the festival. 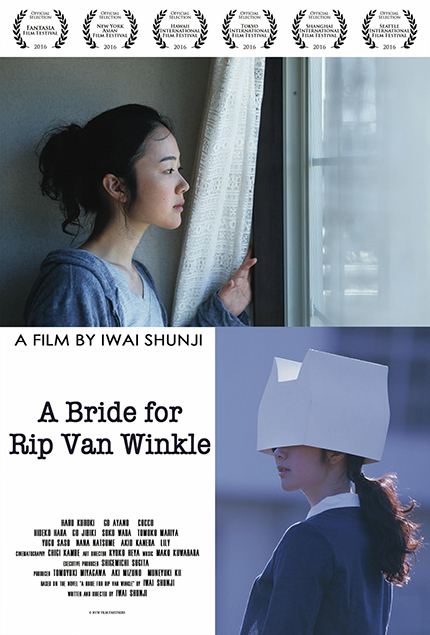 Iwai's latest film A Bride for Rip Van Winkle will be playing with two other titles from his filmography, All About Lily Chou-Chou and Hanna & Alice on April 14th at the New People Cinema in San Francisco. If you win our random draw you and a guest can choose which one of the three films you would like to see and the double pass is yours! As per usual we like to keep things simple when it comes to our giveaways. When you have to answer to our skill testing question e-mail us here and we will randomly draw one (1) winner from all qualifying entrants. Ready? Which years were A Bride for Rip Van Winkle, All About Lily Chou-Chou and Hanna & Alice released in Japan? When you have your answer e-mail us here. We will randomly draw one (1) winner on Monday, April 9th, giving you the whole week to plan your night out at the Cherry Blossom Film Festival. Ganbarou!